New images from the Hubble space telescope are amazing scientists. 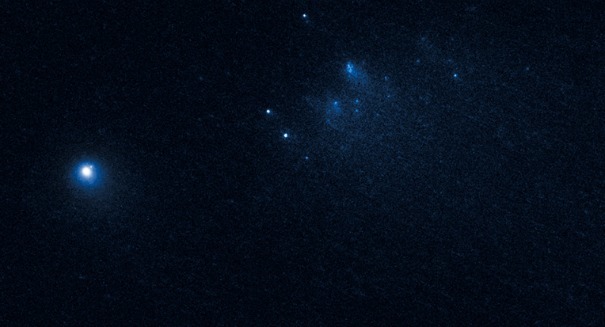 NASA’s Hubble Space Telescope has just captured something absolutely incredible: the most detailed observations yet of a comet breaking apart 67 million miles from Earth. The images were taken over three days in January 2016, and the picture shows about 25 blocks of ice and dust that are drifting away from the comet at a very slow pace, according to a NASA statement. Scientists think that the 4.5 billion year old comet, which is named 332P/Ikeya-Murakami, is spinning so fast that it is ejecting materialf rom its surface, and that material is now scattered along a trail that is 3,000 miles long now — long enough to cover the entire continental United States. These observations show that the comet shards are both brightening and dimming as the pieces rotate in and out of sunlight. The pieces make up about 4 percent of the comet and are between 65 feet wide and 200 feet wide. The comet was discovered back in 2010 by two Japanese amateur astronomers, which it is now named after. It’s not a big comet, measuring just 1,600 feet across.